Take one of Canon's most popular lenses, the Canon 70-200mm f/4 L, add an up-to-4-stop Image Stabilizer and you get the Canon EF 70-200mm f/4L IS USM Lens. If you don't need the subject-action-stopping and background-blurring capabilities of the faster Canon EF 70-200 f/2.8L IS Lens, this lens will deliver everything else you need in a smaller, lighter and less-expensive package. Posing from left to right are the Canon EF 70-200mm f/4L USM Lens, Canon EF 70-200mm f/4L IS USM Lens, Canon EF 70-200mm f/2.8L USM Lens and Canon EF 70-200mm f/2.8L IS USM Lens. The two f/2.8 lenses are shown with their included tripod rings. The f/2.8 IS lens is shown with an optional Wimberley P20 Lens Plate attached to the tripod ring. One of the Canon EF 70-200mm f/4L IS USM Lens' most exciting new features is the image stabilizer. "The image stabilization achieves three shutter speed steps of camera shake correction within 0.5 seconds after the shutter button is depressed halfway and yields correction for up to four full shutter speeds while handheld ..." (Canon's Press Release). Canon's first 4-stop Image Stabilizer makes this lens just as handholdable in low light as the extremely popular 70-200 f/2.8 IS with its 3-stop stabilizer and 1-stop wider aperture. And, you can shoot with this lens hand held at an up-to-4-stop slower shutter speed than with the non-IS Canon 70-200mm f/4L USM Lens. For example (and theoretically), if you need a shutter speed of 1/250 at 200mm without IS to achieve sharp images, you can shoot at 1/15 with the 70-200 f/4 IS with similar results - this is a huge difference. The image stabilizer will compensate for camera movement during the shot (within limits of course). In real use ... Pressing the shutter release half way engages the image stabilizer - a noticeable click and then a quiet hum (low growl) are heard and the viewfinder image becomes still (very nice). Another click is heard when the IS system disengages. I am getting an average of 3-4 stops of assistance from this implementation of IS. The shutter speed of 1/15 at 200mm is a good guideline for me personally when using this lens on a Canon 1Ds Mark II. I have sharp shots taken as slow as 1/4 of a second at 200mm, but the keeper rate is getting rather low at this point. What IS cannot do is stop subject motion any better than the non-IS f/4. If your subject is moving, a faster shutter speed (wider aperture, higher ISO setting, more light) or a flash will be needed to stop the subject's motion. For subjects moving in linear directions (even erratically), you might be able to utilize the available IS Mode 2 (panning mode) which turns off one axis of stabilization. I have not seen it formally stated, but I believe this IS implementation is tripod-sensitive (most new versions are). Canon's manual talks about turning IS off when utilizing a tripod to prevent unnecessary battery drain (minor in my opinion), but it says nothing about preventing bad IS behavior. Like the non-IS 70-200 f/4, the Canon EF 70-200mm f/4L IS USM Lens sports a professional "L" Lens build quality. Although very solid, the weight is a not-bad 26.8 oz. (760g) - very slightly heavier than the non-IS 70-200 f/4 (25 oz / 705g) and half as heavy as the 51.2 oz. (1361g) 70-200 f/2.8 (IS) without a tripod ring installed (Tripod Mount Ring A II (W) is not included with, but available as an option for both of the f/4 lenses - the white A version (version I) works fine as well and the black A (not II) version is even less expensive). Size is a similar story. The f/4 IS and non-IS measure an identical and characteristically narrow/moderately long 3.0" x 6.8" (76 x 172mm) while the f/2.8 IS measures 3.4" x 7.8" (86.2mm x 197mm). This is a "bigger" difference than .4" in diameter and 1" in length seem in type. The 70-200 f/4 lenses share a 67mm filter diameter. 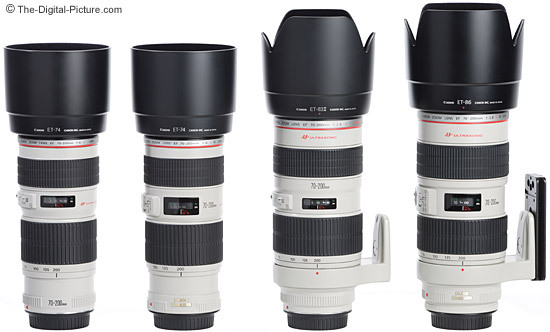 The 70-200 L family is shown above with their included lens hoods. The Canon EF 70-200mm f/4L IS USM Lens is the second lens in the Canon 70-200mm L lens family to sport weather sealing (the f/2.8 IS is the first). This is a very welcome feature but if not using a weather-sealed body, extra care must still be taken in wet/dusty conditions. I frequently get asked ... How good is Canon's weather sealing? First the disclaimer: Get your gear wet at your own risk. With that out of the way ... I avoid but do not fear getting my weather sealed lenses/bodies wet (more because I don't want to clean them than any other reason). But, I have heard reliable stories of such lenses/bodies being dropped into water, being gently hosed off when dirty, used for extended periods of time in heavy rain ... all with no ill effects. This is not an endorsement of these actions and again, you are at your own risk for your actions, but ... now you have an idea. The image stabilizer and great build quality are enticing, but the highest importance for me lies in the image quality. And the 70-200 f/4 IS delivers incredibly in this area. The f/4 IS lens adds 2 elements and 4 groups to the non-IS lens. From what I can see, the additional glass has not adversely affected image quality in any way. This lens is extremely sharp wide open and from corner to corner even on a full frame body. There is little improvement when stopping down - the f/4 IS starts out sharp wide open. Impressive performance. The non-IS 70-200 f/4 is similarly sharp in the center over the mid and long portion of the focal length range, but the f/4 IS is sharper in the center through 85mm or so and is noticeably sharper in the corners over most of the focal length range. These two lenses are most similar at 200mm. These differences are reduced as the subject distance is increased (the non-IS lens performs more similarly to the IS lens). The f/4 IS and f/2.8 IS 70-200mm L lenses are similarly sharp at identical aperture and focal length settings. Canon EF 70-200mm f/4L IS USM Lens images have great color and contrast. CA (Chromatic Aberration) is very well controlled, though some is visible in full frame corners at 200mm. Mild barrel distortion is present at 70mm and mild pincushion is present at 200mm. The change from barrel to pincushion is gradual with 95mm being the approximate focal length of the crossover. Distortion is nearly identical between the two 70-200mm f/4L lenses. The 70-200 f/4 IS controls flare very well - slightly better than non-IS f/4 and even more noticeably better than the f/2.8 IS. Vignetting is rather well controlled but full frame body users will notice darker corners beyond 135mm at f/4. The f/4 IS lens appears to have slightly less vignetting than the f/4 non-IS lens. The 8-blade circular (a new feature) aperture (diaphragm) create a very pleasing foreground/background blur quality. Out of focus specular highlights are nicely rounded blurs even when shooting at narrow apertures. Having a constant f/4 aperture (opens to f/4 at all focal lengths) is a very nice feature. Exposure settings do not require a change as the lens is zoomed through the focal lengths. If your lighting is constant, set a manual exposure and shoot wide open aperture at all focal lengths without the exposure-changing concerns that exist with an f/4-5.6 or similar variable maximum aperture lens. This lens will close down to f/32, but I rarely use an aperture narrower than f/16 as image sharpness degrades rapidly due to diffraction (on all lenses). While an f/4 aperture is reasonably wide, it is still narrow enough to allow the f/4 IS lens' relatively small size and weight. At the same time, f/4 is wide enough to create some background diffusion - especially at 200mm. And with IS, this f/4 lens is fast enough to be handheld in very low light conditions. Indoor action photography will likely require a flash with this lens. Above, the 70-200 f/4 IS is shown mounted on a Canon 400D Digital Rebel XTi. All of Canon's 70-200 L lenses share similarly excellent autofocus characteristics. The Canon EF 70-200mm f/4L IS USM Lens focuses VERY fast, very quietly and very accurately thanks to Canon's excellent Ring USM (Ultrasonic Motor). FTM (Full Time Manual) focusing is enabled. The focus and zoom rings are very nicely sized and turn very smoothly - They are very nicely damped. The 70-200 f/4 IS does not extend with zooming or focusing - and the front element does not rotate. New to the f/4 IS version are recessed switched (IS, IS Mode, AF/MF, focus limitation). These switches are slightly harder to change, but much less susceptible to accidental changes - this is a very good change from my perspective. Actually, the enlarged switch area and increased number of switches are the most visible differences between the two f/4 lenses. Like the non-IS f/4, the IS version includes a focus limiter switch. If close subjects are not on your menu, switch from the full-range 1.2m to infinity position to the 3m to infinity position to improve focus performance. The 70-200 f/4 non-IS lens switches are shown on the left in comparison to the IS version switches. Additional - and almost completely irrelevant - changes can be seen in the above photo. With a minimum focus distance of 3.94' (1.2 m), the 70-200 f/4 IS yields a maximum magnification of .21x. This value is not great and not bad - adequate for nice flower pictures and close portraits. Adding a 12mm Extension Tube will extend magnification to .28x (at 200mm), but better results come from the addition of a 25mm Extension Tube - yielding a .42x magnification (at 70mm). 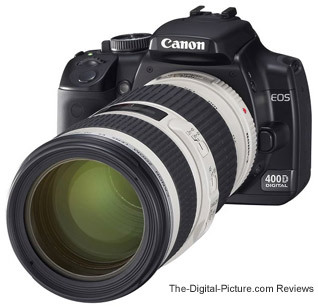 A Canon 500D Close-up Lens is not an option for this lens as it is not available in the 67mm filter size. Compatibility with the Canon Extender EF 1.4x II and Canon Extender EF 2x II adds to the Canon EF 70-200mm f/4L IS USM Lens' already-high versatility. With the 1.4x attached, the 70-200 f/4 becomes a 98-280mm f/5.6 lens with very good image quality. Added barrel distortion and CA are the downsides. Image quality starts declining more noticeably with the 2x extender - and the resulting 140-400mm f/8 lens only autofocuses on Canon's 1-Series bodies (and with the center focus point only). This combination results in a very dark viewfinder. Maximum magnification increases to .31x and .45x with the extenders attached. I frequently get asked ... Does IS continue to function with extenders mounted? The answer is yes, and it actually becomes more valuable as apertures become narrower and focal lengths become longer. An additional downside to the use of extenders is slower autofocusing. Canon says the slower AF is by designed to retain proper AF control. The Canon Lens Hood ET-74 and a Canon Lens Soft Case LP1224 are included in the box when the 70-200 f/4 IS is purchased from a reputable retailer. A Lowepro Lens Case 3 provides a far more protective home for this lens. As I mentioned earlier, the Canon Tripod Mount Ring A II (W) (or the A not-II version) is not included, but it is a nice option if you are planning to use this lens on a tripod with any frequency - or with a flash bracket. 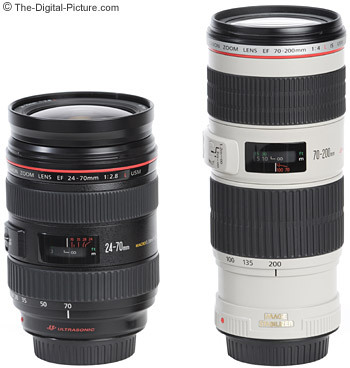 The Canon EF 24-70mm f/2.8L USM Lens and Canon EF 70-200mm f/4L IS USM Lens are shown together above for size comparison. After my general purpose zooms, the 70-200mm telephoto zoom focal length lenses are my next most-used lenses. I simply find a very wide range of uses for theses focal lengths. Here is a pair of full frame sensor focal length comparisons. Let's start with portraits. Depending on which FOVCF body you are using, the Canon EF 70-200mm f/4L IS USM Lens contains much or all of the classic portrait focal lengths range (85mm to 135mm effective focal lengths). And, the longer focal lengths allow even tighter framing while maintaining a flattering perspective. An f/4 lens is not the narrowest aperture portrait lens available, but often portraits are taken at f/4 or narrower apertures to keep all facial features in focus. Using the longer focal lengths of this lens along with some unobstructed distance behind the subject will enable a diffusely blurred, non-distracting background. With IS, subject movement is going to be the limiting shutter speed factor (not handholdability). You need a very still subject for a 1/60 sec portrait. 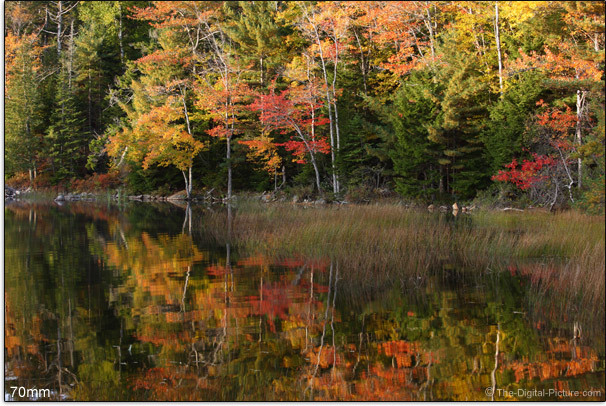 The Canon EF 70-200mm f/4L IS USM Lens is a superb landscape photography lens. Landscape photography often involves narrow apertures for a large DOF (depth of field), super-high resolution to capture tiny details and light weight/small size for portability as the ultimate captures often require a hike. IS adds low-light-handholdability to the package for when using a tripod is not practical or possible. Although wide angle lenses get the most attention for landscape photography, you need a very broad area of photographic interest when using these lenses. A tele-zoom lens will allow a more-isolated and/or distant area of beauty to be captured and will provide a more-compressed perspective obtained. If the lighting is good, Outdoor sports photography is another great use for this lens. The FOVCF of the body you are using will make a big difference in the usefulness (reach) of this lens for the larger field sports. Full frame users will want the Canon 1.4x Extender attached when shooting smaller fields - and will want a longer lens when shooting the big fields (think 400-600mm). With a 1.6x body and a 1.4x, the 70-200 f/4 IS reaches well into the action in the larger fields. For shorter distance sports in good light, this is a great lens for capturing the excitement. If sports are your primary goal for this lens, you might be better served with the less-expensive Canon EF 70-200mm f/2.8L USM Lens or the more-expensive Canon EF 70-200mm f/2.8L IS II USM Lens. Both f/2.8 lenses are able to let twice as much light in as the f/4 counterparts - this directly corresponds to shutter speeds that are twice as fast. With a 1.6x body and/or with a 1.4x extender attached, the Canon EF 70-200mm f/4L IS USM Lens makes a nice general wildlife photography lens. Serious wildlife photographers will want a longer focal length (400-600mm), but there will be lots of nice wildlife shots made with this lens. And for many, many other general-purpose tele-zoom needs, the 70-200 f/4 IS will be a great solution. For shooting at the park (public park, ball park, water park, ...) the beach, the vacation rental house, or just out in the back yard, this is a great lens to have in the kit. 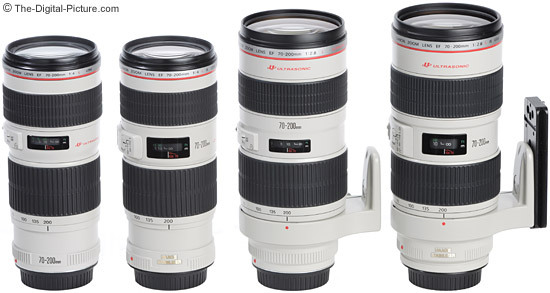 Most people considering the purchase of a 70-200 f/4 IS will also consider the Canon EF 70-200mm f/2.8L IS II USM Lens. As mentioned before, the f/2.8 version is larger, heavier and more expensive. But, the wider aperture can be worth the downsides if you need it. Both lenses deliver similar optical performance at similar apertures. If you do not need or can't afford the IS version of the Canon 70-200mm f/4 lens, consider the non-IS version as the Canon 70-200mm f/4L USM Lens is still the great lens it has always been. Long after I created the Canon EF 70-200mm f/4L IS USM Lens review, Canon introduced the EF 70-300 L Lens. If you are considering the purchase of the EF 70-200 f/4 IS, you should read the Canon EF 70-300mm f/4-5.6 IS L USM Lens Review to make sure that lens does not have any advantages for you. A Canon EF 70-200mm f/4L IS USM Lens review would not be complete without mentioning its biggest downside - a moderately high price. The premium over the non-IS version is substantial - and will be insurmountable to some. But, this lens will be worth the price to many - including myself. IS and improved image sharpness are very valuable to me.